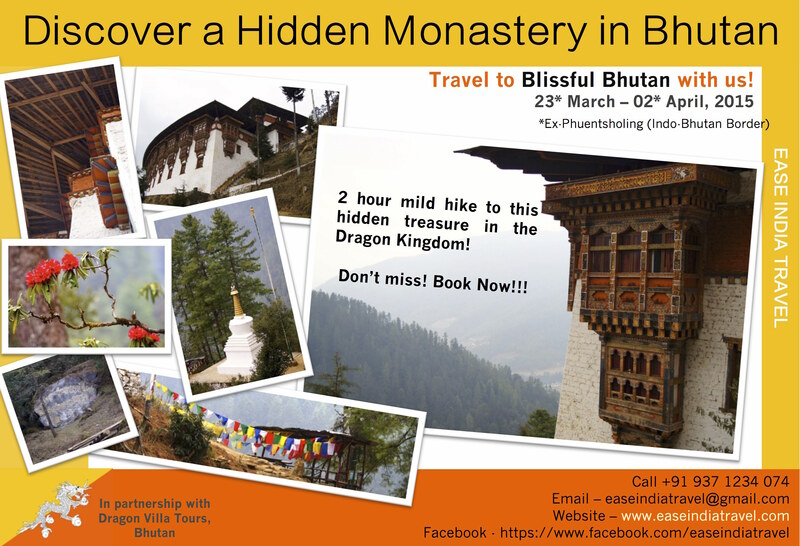 A two hour mild hike will help you discover a hidden monastery and school of Buddhist studies on our Blissful Bhutan tour (23rd March – 02nd April, 2015)! When you set off to discover the hidden treasures of Bhutan, its monasteries in particular, you will find that these monuments, some as old as 12th century, are located on mountain tops and hillsides inaccessible by any mode of transportation; only on foot. Many of them are mild hikes, easily covered in under 4 hours, and offer some of the most spectacular views of the topography that has helped shape Bhutan’s unique culture. And of course, at the end of the hike are the majestic monasteries that by their sheer size and structure make you wonder at the effort that must have gone into building them, stone by burdensome stone, in an age when cranes and sophisticated building equipments were far from being invented. The Blissful Bhutan tour is on from 23rd March – 02nd April. Guests will have to travel to Kolkata to Indo-Bhutan border town to join the trip! Only 15 guests on this fabulous trip! Hurry!!!!! Write to us at easeindiatravel@gmail.com or if you’re in India, pick your phone and call us on +91 937 1234 074. Our detailed itinerary and other details are available on request.